ASIA/HOLY LAND - Palestinian Minister at the Vatican: "We would like the Holy See lead a Conference on Jerusalem"
Rome (Agenzia Fides) - The unilateral decision of the US Administration to recognize Jerusalem as the exclusive capital of Israel "is undermining the possibility of having positive results concerning peace negotiations", because it brings the issue to a "religious dimension that further complicates the situation" . 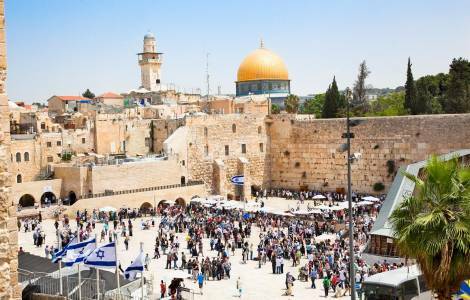 Israel "is taking advantage of US President Donald Trump’s decision to increase pressure on the Christian presence in the Holy City". This is why it is important for the Holy See to lead a Conference on Jerusalem, calling the leaders and representatives of all the Churches and communities of baptized to reaffirm that Christians will not renounce the interests that bind them forever to the City where Christ was crucified and rose again. This is the proposal that Riyad al Maliki, Palestinian Foreign Minister, brought to the attention of his Vatican interlocutors, in the meetings held on Thursday 15 February with Cardinal Pietro Parolin, Vatican Secretary of State and then with Archbishop Paul Richard Gallagher, minister for foreign affairs. "During the meetings with Cardinal Parolin and Archbishop Gallagher", the Palestinian Minister told Fides "we shed light on the implication of President Trump’s decision to award Jerusalem as Capital of Israel. Trump’s decision had the effect of connecting the city with only the Jewish world, setting aside the city’s connections with Christian and Muslims and ignoring the fact that Jerusalem should also be the capital of Palestine". According to al Maliki, the US unilateral move is undermining the possibility of a successful outcome of the negotiations to end the Israeli-Palestinian conflict. "We" explained the Palestinian Minister "want to keep the conflict at a political level, while Trump’s decision brings the issue to a religious level, and this further complicates things". With the choice of the US administration, the conflict does not remain limited to relations between Israelis and Palestinians, but fatally assumes global dimensions, because from now on "every Muslim, in Indonesia, or Malaysia, or Senegal will feel the responsibility and the obligation to do something to protect his religious interests" in the Holy City.